A few headlines from earlier this month: “Artificial Intelligence as Good as Experts at Detecting Eye Problems” (Guardian, Aug 13), “AI Platform Screens for Acute Neurological Illness” (Science Daily, Aug 13). In the space of a day, it seems two entire professions, optometry and diagnostic radiology, might be on the chopping block. McKinsey estimated in 2017 that today 51% of jobs in the US can be automated away²; in a personal conversation an ex high-level google employee suggested that the figure could be as high as 97%. So these are some of the horror stories around. There are also of course ecstatic ravings about a post-human future in which we all upload ourselves and live lives which make religious paradises seem cut-rate. AI, it seems, for better and for worse is our future. But what does this have to do with art? There have been other exhibitions, for example at the Grand Palais, or the upcoming one at Victoria & Albert that have included the word ‘AI’ in their show concept or title. Most of them have had to do with what I started out with: conceptual art about the social consequences of AI. Sometimes there have been one or two pieces of art generated by AI that gets shown but as part of the overall idea that AI is an important social issue. 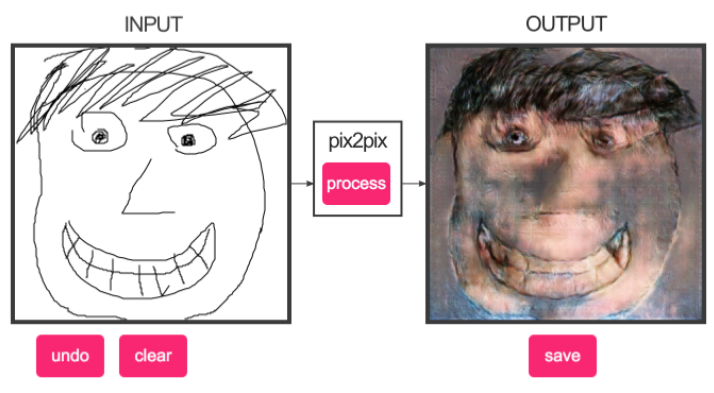 We at 64/1, on the other hand, decided to focus only on art all made by AI in collaboration with humans. In other words, we want to establish AI art as something that matters deeply for the visual arts; as something that will force us to reevaluate our aesthetics. Why? And why do the show now? We need to get something out of the way: what is AI? Well there are two kinds - one based on rules and logic and a more recent one, which I’ll focus on, based on statistics. Neural networks (NN) are a good example of the latter. They are motivated by the structure of our brains. There are a few kinds of NNs that generate images but just for simplicity I’m going to call them all GANs (these are image-generating algorithms called Generative Adversarial Networks). 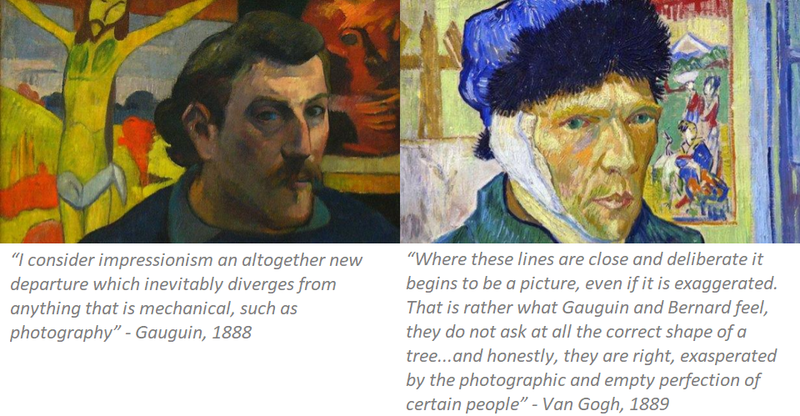 Here’s what is amazing about them: the artist who works with them gives them no information about human visuality, no rules about aesthetics, about line or color or composition. 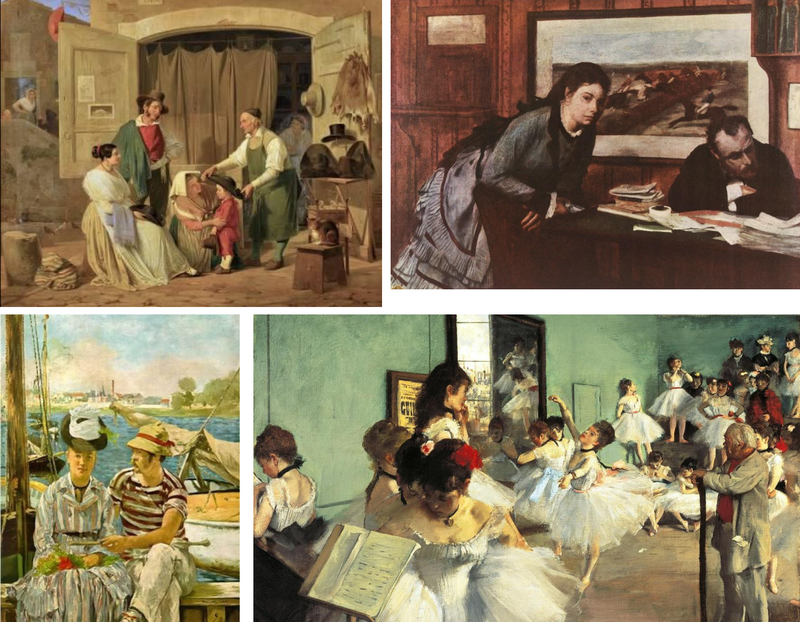 They figure all this out just by studying lots and lots of examples of art which is curated by the human artist and is called the training set. Before we proceed any further, we need to dig a little into the history of AI art. First, its not very old! 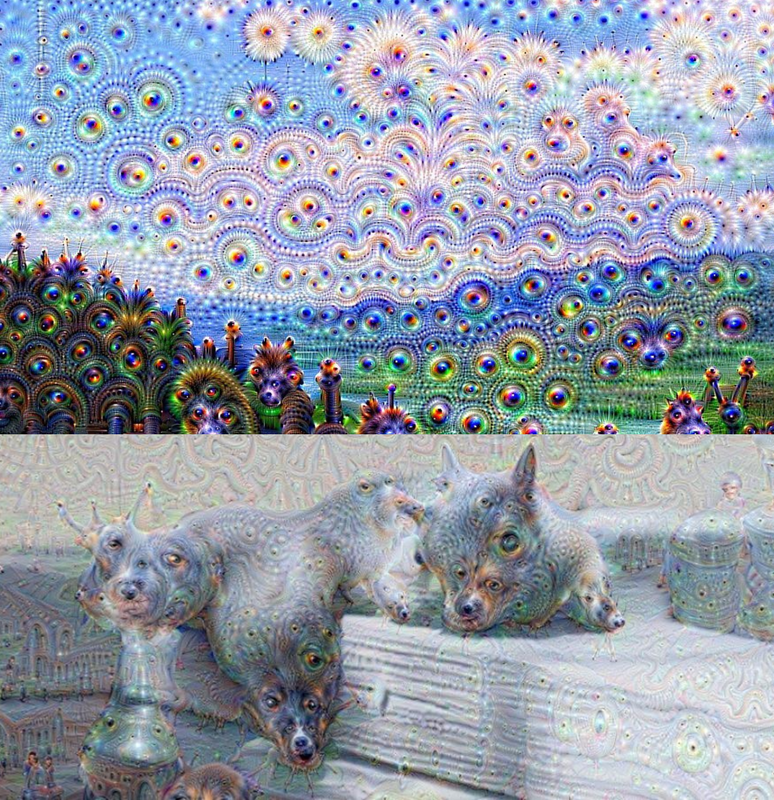 Perhaps the first wave of interest in images produced by AI was in mid 2015 with Google DeepDream. While it sparked some interest in the general public, it didn’t quite spark an art genre. The main reason: it all looked the same aesthetically. The next big step was the common availability of an implementable version of a GAN (actually a cGAN called pix2pix, but we won’t be picky!) in early 2017. Some of the early pioneers who started working right away with this stuff were Mario Klingemann and Memo Akten, two artists who are part of our show. While the early images were really interesting for the advance on previous image-generating algorithms, after a while they too seemed a bit aesthetically monotonous and conceptually not all that rich. What has happened in the past year and a half is that is that the field has expanded and the art has become far more conceptually rich, aesthetically varied and interesting. Which is why we think it is time we defined it as a genre; to think about its limitations and possibilities; to understand the practice of this new breed of artist-programmers who have started engaging with AI, and to start pondering important questions about creativity. Aside from the much discussed loss of the ‘aura’ of the artwork, and while initially painting was inspired by photography, it became more tonal at the expense of it. Composition was influenced by the precise perspectives and the framing of photography. But over the longer run, by the 1880s when photography started to become accepted as a new art form, realistic precision became less valued and we also saw the loss of linear perspectival compositions, both of which photography could out-compete painting in. Suddenly the two main motors of advances in painting seemed incidental, inessential to the medium. And of course we know how radically photography and painting diverged after this. We are in a photography moment. With AI too we have to ask the question ‘what can the AI painter do better than the human?’. Let’s think about it in terms of the three Platonic and later, Kantian categories of concept - ethics (or what I’ll call relation) and form. 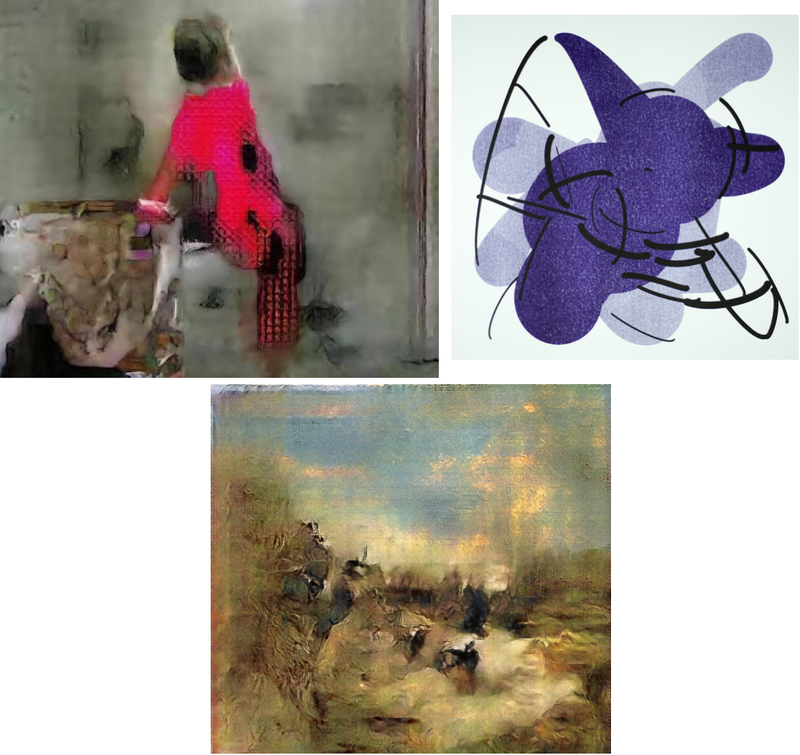 Last year researchers from Rutgers who had designed a variation of a GAN showed samples of their AI’s output mixed with randomly selected art from Art Basel 2016 to mechanically-Turked humans. The humans consistently rated the AI art higher on intention and creativity and thought there was a higher chance they were made by humans. Now this is at best suggestive. There are big problems with their methodology — for starters, one doesn’t reduce an appreciation of contemporary art to a simple random survey result. But I hope it disturbs any complacency anyone may feel that about the pattern making ability of AI. More tellingly, Jake Elwes, one of the artists in our show, tells an anecdote about how when a prominent curator from the Royal Academy saw his work with AI, he insisted angrily that this couldn’t have been made by a machine and imputed that Jake had in fact painted some of the stills himself. My basic point with all this: relying on purely formal properties and pattern making abilities of humans might be a dead end. Another potential way forward for the artists is the notion of materiality. The rise of the virtual has seen a corresponding retreat towards the object-hood of a piece of art; with painters, for instance, doing interesting things with frame and the structure/surface relationship. However, as important as this option is for a world increasingly and frighteningly fluid, unstable and unreal, I have to wonder whether technology will not outpace this desire too. And I’m not just talking about design by AutoCAD and 3D-printing. There are already painting machines being developed by several companies, including the one by Artmatr, that can turn certain digital images into material paintings done in oils or acrylics. Moving on, what about concept or idea? This has been one of the main source of aesthetic innovation after the rise of Modernism. I started out by mentioning there were two broad approaches to AI. Well, the other kind of AI that functions on logic, and works with rules and semantics is becoming quite good at language; at language games. And in so far as the concept of a conceptual piece of artwork is a Wittgensteinian Language game, I think very soon this kind of AI will start to equal our capacity to play them. In the Indian context we can think of Rigo 23’s installation Echo Armada at Kochi-Muziris 2012; it is not clear at all what the actual artwork adds to the verbal expression of the idea; indeed it is parasitic on the latter. 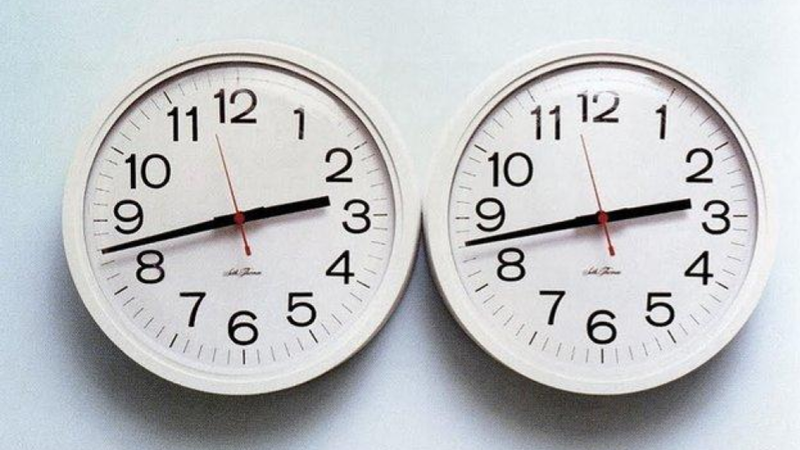 This sort of artwork essentially relies on the straightforward visualization of a verbal text. 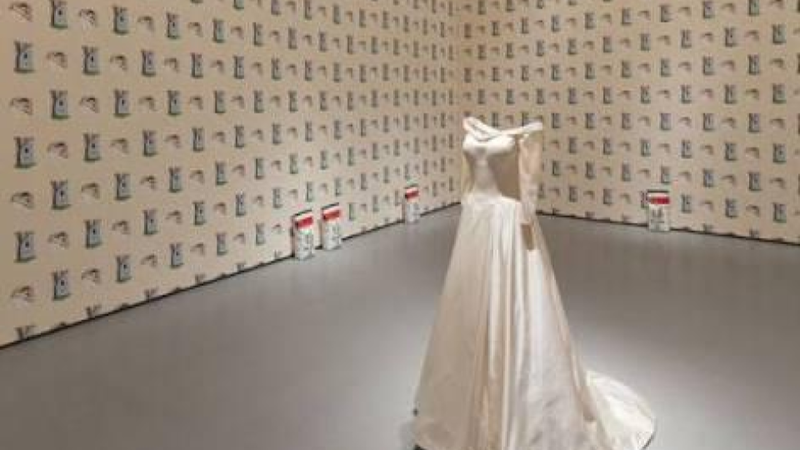 Let’s consider the following thought experiment: Suppose I built a very very crude program that made a simple sentence by combining nouns from different semantic domains — say it produced “a wedding gown and cat litter in a room wallpaper of lynchings.” — I don’t think we’ll get anything very different in significance or viewerly impact from the famous Gober installation. And of course this is unutterably crude but I can well imagine the day when we turn to the computer for a menu of concepts for conceptual artwork, and even for images of their realization, and our only human job will be of choosing the one that moves us most. Moves us. That brings me to the what I think we humans can still do better than machines though all this is very speculative and I may be wrong if machines turn out to have affective states and interiority! I will now talk about the middle term, the thing that mediates concept and form, through our internal experience of living, in the form of a relation to an object, and I’m going to call it the ethical dimension of an artwork. Because all this is so speculative, I want to drop my hat as a curator and wear my usual hat as a human confused about life (my curatorial other half, Raghava, at some point egged me to move to the personal, and not keep droning on about the ethical, which is at the heart of the personal, in impersonal terms). In particular. a human, or post-human, confused about life, its purposes and prone to feeling anything I do can be rationalized away as insignificant. Yes I’m one of those insufferable types. I was a business analyst at McKinsey, going through a particular patch of feeling a lack of control over my life, feeling like a cog in a world of cogs. I used to go as much as possible to the Phillips Collection and spend hours there, not really truly looking at the art but perhaps just being consoled by thinking I was. And one day, I vividly remember the particular moment, something in me started to respond to what a particular painting was asking of me. 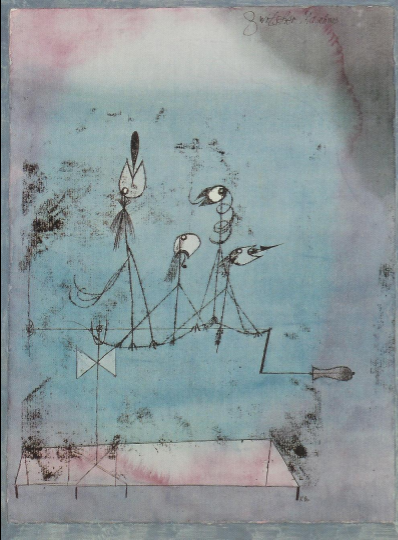 This one, the Klee’s Twittering Machine. Let me describe it for you: it’s tiny, maybe 1 ft by 1 ft. It’s on paper and looks flimsy aside from the whimsical, childishness of its execution. The pink even looks awkward in places. And it depicts a somewhat useless thing, a blend of bird and machine. Lots of commentators have talked about how dark it “actually” is; they all end up talking about the concept, what it supposedly “means”. Arthur Danto, the famous art critic after mentioning the formal qualities I just mentioned, immediately moved to talking about the signifier they are supposedly expressing. But I think this is all the excessive logocentrism of Western thought, the belief in the logos, in reason and in the verbal. Because what struck me was not what it meant, whatever that might be, but the precisely those perceptual qualities, the way in which it was establishing a relation with me. All these things — flimsiness, the childlike freedom, the scale — that communicate non-verbally yet elude the search for what the painting means. These were the qualities that established a moral and ethical relation with me: its size and it delicate silliness never overwhelmed, its avoidance of the grandiose dramatic. Wasn’t all this, wasn’t this paintings’ spiritual temperament, not a way to face life? A manual for being? And that’s what I’m talking about: a painting as a face. As theorist Agamben says, faces are neither universal ideas nor mere perceptual particular form. They signify, but non-verbally, mutely. I’m not going back to Thierry de Duve’s idea of a painting as facingness, as bare presence. Facingness is not face. Some paintings want to shock us, some want to please us, some mystify; they have an intention on us. And I think this way of manipulating the relational dimension of a painting will remain the province of humans for a long time. I can’t but help remember the famous Rilke poem, Archaic Torso of Apollo, and its final lines. Rilke was our best theorist of this dimension of art. The poem, after describing the strange irradiating hold that a sculpture, the headless torso of Apollo, has on one responsive to it, ends: “denn da ist keine Stelle, die dich nicht sieht. Du musst dein Leben ändern.” For there is no place in the painting that doesn’t see you. You must change your life. This is what I’m trying to gesture at — the way in which a particular painting sees you, sees into an aspect of you, into a facet of your interiority. Before I end, I want to talk about a few speculative theoretical terms — the absolute and the relational — to start to deal with this ethical dimension of artwork. 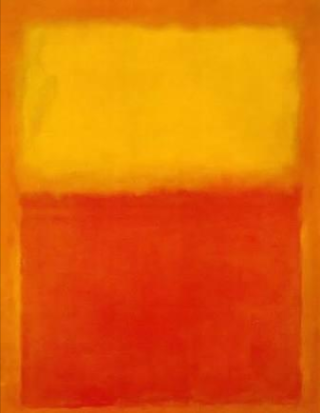 Look at this Rothko. It’s enormous. Hung close to the floor. Rothko recommended the ideal viewing distance be 18 inches! It engulfs you. It establishes a relationship of total environment. It’s god in the burning bush saying “Ehyeh asher ehyeh.” I am that I am! I’ll call this relation absolute. I’m not trying to go back to the old critical distinction between a painting as shout or style. I’m trying to talk about the manipulative, power-centered ethical relation they establish with you. Look at this work by young Brooklyn painter Ezra Tessler. It establishes a completely different relationship with the viewer. It’s neither shout nor style. It’s made of 3 different materials, ranging from natural to artificial, each of which wear their materiality on their sleeve: moleskin, acrylic, wood. The outlines are zany. It’s like a homemade puzzle piece. The dimensions are small, artefactual: it is no image capturable digitally, you have to be there, bear witness, walk around it. This is no god in the thundercloud, but more like the created-creative god of the Sufis like Ibn ‘Arabi. This is the call to the viewer I’m calling relational. I want to end with a paradox. I started out by saying that perhaps the nonverbal ethical dimension of the artwork was the human domain exemplary. But then, nothing prevents us from extending the intensity of the encounter with the artwork to all of perceptual existence. All sights, sounds, once we see them in the ethical frame relate, speak, move. Perhaps we cannot ever respond to them adequately. We’d be saints if we did. And art, to twist Kafka around, is only a little axe, at best, in the face of the frozen seas within us. But at this point, when the attempt at this extension is made, and here is the paradox, doesn’t it then become irrelevant what I’m responding to, whether it was made by machine or man, made or given, high art or low art? And with that thought we have passed over into religion. The kind of religion, like some Sufi thought and Tantric Hinduism, that values perception, that values the world we live in. I’ll leave you with an image. 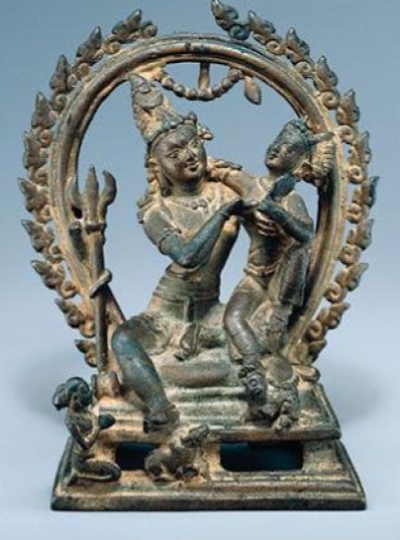 Shiva, or pure consciousness, has materiality and mind, Parvati, on his lap. They stay linked and it is only in the embrace and in the mirror Parvati shows him that he recognizes himself. There no severance from the perceptual, no flight into the realm of the idea as in The Kantian sublime which has dominated the western art tradition. The world is all there is and it is only in our relation to it that we find ourselves. A curatorial collective founded in early 2018 by artist Raghava KK and former econometrician Karthik Kalyanaraman to think through and promote art engaged with issues of the future. 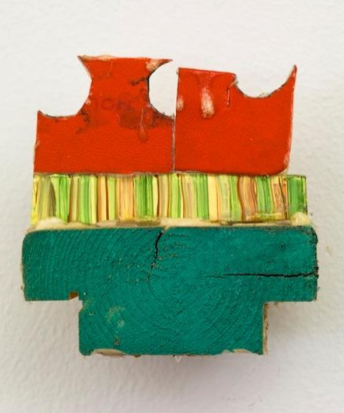 See for instance the ongoing lovely show at the Los Angeles gallery, The Landing.